Amazing! I added a splash of vanilla a few mini chocolate chips and just a little chopped up unsweetened coconut. The best part is they only take a few minutes to whip up! Thanks Gina! I wonder if applesauce would be a good alternative. Or a whole apple blended right from a blender. If anything, after its cooked it would make great granola to mix in yogurt. I’m on weight watchers and these are my go to sweet made the mini chocolate chips. . Keep in the fridge! Made these this morning! I added 4oz of chocolate chips per my daughter’s begging lol. They’re ahhhhmazing! I made these and they were super easy and delicious. I brought them to a function and they were a big hit. People couldn’t believe they were so healthy. Lol. I followed the recipe mostly. I added in 2tsp chia seeds and drizzled with melted chocolate after they came out of the oven. Definitely something you could add your own favorite mix-ins like previous commenters stated. 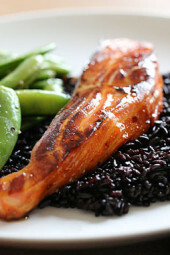 Thank you for a delicious, simple AND healthy recipe! Do you happen to know how many Freestyle Points these are? Has anyone tried using less walnuts to lower the calorie count? I used regular rolled oats because I didn’t have quick oats and thought they still turned out awesome! New favorite recipe! I added cinnamon and raisins, too- yum!! With a latte or milk….so good. And quick! Thanks! I have never made these before, but had 3 bananas to use up. Didn’t have quite enough quick oats so added about a qtr cup Irish steel cut oats, some cinnamon, and an egg. They were delicious and had a little crunchy consistency…don’t know if this is normal or due to the steel cut oats. Will def make these again. I bake them and store in fridge or freezer. I add choc chips sometimes. Charlie- no idea if you’ll see this & reply, but fingers crossed… When putting them in the freezer, do you bake them first or just prep the dough/cookies and flash freeze to bake later? If you’re baking them later, how long do you defrost them before baking? Thanks in advance for any help! Do u think i could add some ground flax seed to the batch n how much??? I am making these this weekend! They sound delicious!!! could you add peanut butter to these? Or do you have a similar recipe with peanut butter?? Thanks! Hi Gina! Can you use bananas that have been frozen for this? Thanks! Love these – and I usually hate things like this! Most important thing is to go into these knowing they have the consistency of banana bread rather than true cookies, so as long as you are not expecting a cookie texture, they are delicious. Tried them with mini chocolate chips and tonight I am going to try walnuts. 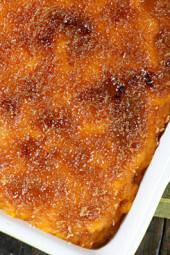 Thanks for a great week-day dessert recipe! okay, amazing! Been tryung to eat healthy and needed something to satisfy my sweet tooth. I used wheat oats, the bananas, walnuts, added almonds, and a couple of chocolate chips, and sprinkled the top with coconut. Super yummy, thanks! I had no almonds instead,I used grated,roasted coconuts and raisins….it turned out well.. too delicious! These are soooo yummy! I just baked them to put out for Santa tonight. ? These are the best little cookies. I make them at least 2 times per week. I have two little nephews (8 and 5) who fight over these! If one eats them all I have to make another batch. Even if they eat them ALL they are eating bananas, oats, and just a little chocolate chips. very easy to make, will make again. Taste like banana nut bread. 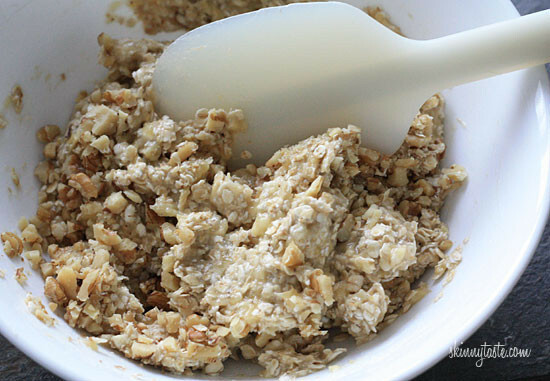 Are the oats necessary in this recipe, or can they substituted/omitted? Thanks! Wasn't a big fan of these. I love oatmeal with bananas, so I made them with that and a couple tablespoons of mini chocolate chips. I didn't like the texture at all – too gummy/pasty tasting and I realize after reading more comments this was to be expected. I guess what my brain expected =/= what this recipe is about. Thanks anyway! Hi There, these look great.. I see your comments said "best out of the oven" are they okay for a few days or better on the first day? Instead of walnuts, I used my nuts. My GF loved them. 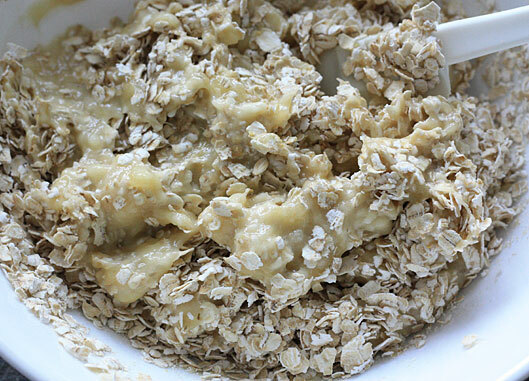 What to use instead of oats? I cannot have oats. I just made those cookies for the third time. 3rd try just half an hour ago: oats, bananas, chocolate chips (a lot in comparison to the dough, probably like 40g) and some flaxseed & sesame seed. I made these last night along side the traditional chocolate chip cookies I made for my husband. They did the trick to solve my cravings for choc chip cookies and keep my on track for WW. 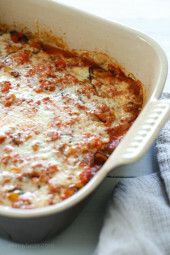 Recipes like yours Gina are such a blessing for me as I come down the homestretch to lose my last 10lbs! I made a variation that is similar, but I added honey, used granola instead of oatmeal and added flax seeds and peanut butter. Loaded with protein so they fit hunger for several hours. They are in the oven now! What a great after school snack. Thanx! I added dried, no sugar added dates in place of nuts or chocolate chips, any idea what the pp+ would be? I really enjoyed these, and to think they only have 3 ingredients. So easy. Thank you! I look forward to trying these! They seem fairly guilt-free, for a cookie anyway. I have never met you….but I LOVE YOU!!!! This will be an amazing breakfast food for my early bird kids. I have been buying protein bars and they gobble them up in a hurry before school! they get pretty expensive at 80 cents per bar, multiply that by 3 every day. I'm tired of cereals and all the carbs, eggs are great but they are too young to cook yet. These will be great as they need no refrigeration, I just whipped up a few batches as soon as I saw this because I had some bananas waiting to be made into bread which I dreaded because we just eat and eat and eat the bread. The first batch I made with just the three ingredients. In the second batch I added some craisins and sprinkled some ground cinnamon on top, and the third batch I sprinkled a few chocolate chips in. My very picky kids LOVE THEM!!! I could kiss you……..You are my HERO!!! Gina, can you freeze the cookies? I live alone, and I figure if I make a bunch and freeze this way I don't have to eat them every day for a week! 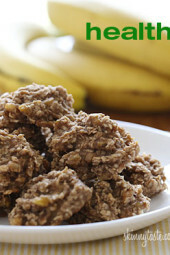 My two year old grandson loved them – I made the ones with oats, bananas and raisins. Then, my husband wondered why I didn't make him any so I had to make more. LOL. I still have two test them on my teenage kids. Just made these tonight!! I added almonds and a drop of agave…..amazingggg!!!! I plan to make these weekly for a healthy, guilt free treat!!! I wish more recipes were simple and completely natural like this one. Butter is so unnecessary…..
2 bananas equal 2/3 cup.. Generally it is said that there are 3 bananas per cup.. Bananas are sweeter than pumpkin and unsweetened apple sauce you may have to adjust the sweetness in your batch.. Good luck! I love to make a few batches and freeze them! 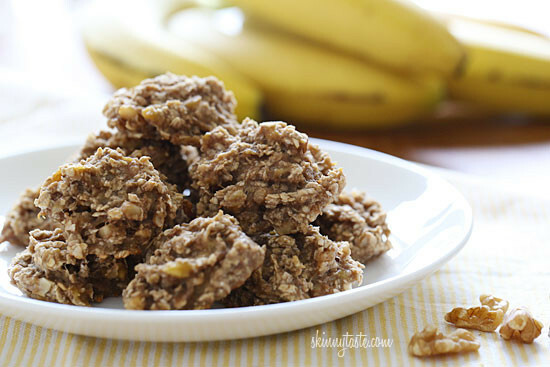 I've made these cookies twice so far and my son who says "I hate bananas" loves them and he knows exactly what is in them. 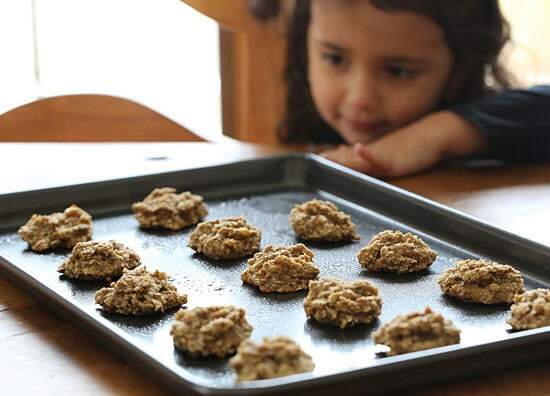 I did try them with rolled oats (versus quick) the second time and the kids had no problems (I rarely have quick oats on hand). I have also learned the way to get the child who hates bananas to eat them, is to add about 2 T of mini-chocolate chips. I also tried them the second time with peanuts and the kids loved them. So easy and simple to make and to make them last, I will freeze them and pull out as needed for the 4 and 6-year-old lunches. Just made these. I didn't have walnuts on hand, but I had almonds & cashews. 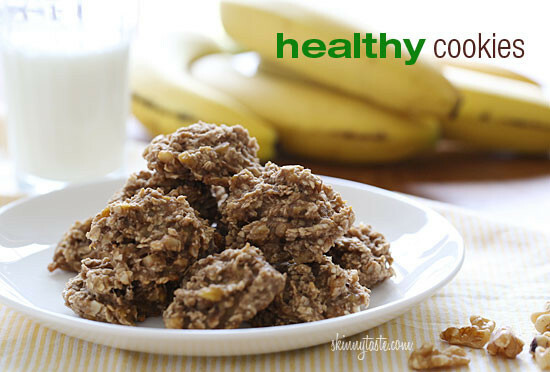 I thought they were a great alternative to sugary, fat-laden cookies. I would love to try them with peanut butter chips in place of the nuts. So easy. Thanks again, Gina! These look so easy and delicious! I am going to try these with toasted pecans! Am I the only one who cannot for the life of me get this recipe to make 16 cookies? Mine makes 11… 12 TOPS! Even then they are really really small. I LOVED them thought! Totally yummy! 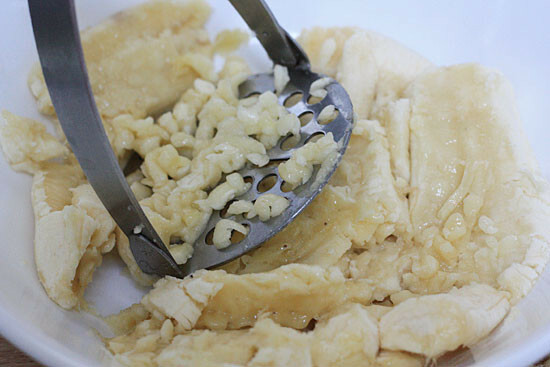 Use a tablespoon sized measuring spoon to scoop the cookies. Yep, I am also not getting 16, but I think I need to make them smaller! It might be because of the size of the bananas. I just made them and used a slightly rounded tablespoon and I got 19 cookies. Thanks for the recipe, these came out great! I love how versatile it is, you can add different things and try different combinations. Made these for a vegan house guest and ended up eating most of them myself! Def yummy with some chocolate chips too. I ate a couple for breakfast! I made several batches of these over the weekend (Saturday). We like banana bread, and these really reminded us of that. I made the recipe above and also some with chocolate chips instead. We liked both but by tuesday all the remaining cookies molded! I like to do serveral batches at one time and put them in my cookie jar, but unless I can freeze these cookies, that won't work. The cookies were nice and moist days later…probably why they molded so fast 🙂 I will try freezing some to see if that works at some point. I made some GF ones that I sent home with friends, which didn't have the best consistancy…they were much more sticky after baked. The non GF ones were much better if you don't have to go that route. I kept mine in the fridge and they were fine! Has anyone tried making these with protein powder added? I'm trying to find new snacks. I added hemp hearts – very high in protein and adds a nutty flavor. I use the hemp hearts on ice cream too!